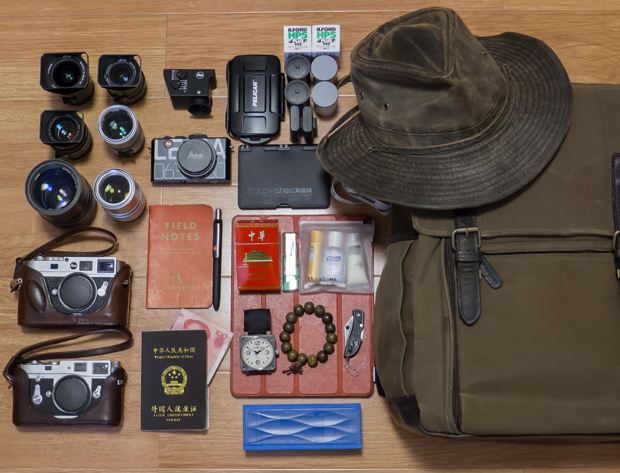 Below is my submission for “What’s in Your Bag” on Japan Camera Hunter. I’ve enjoyed following along with these, as well as seeing some of my friends (Jason Howe, Todd Hatakeyama among others) send in their photos. Ona “Camps Bay” waxed canvas with leather straps. 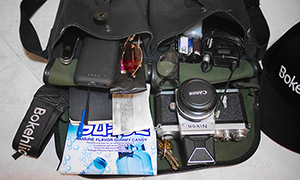 There is a divided bottom section for lenses and bodies, and a top compartment for personal items, jacket, computer, etc. This backpack is comfortable and water repellant in the rain, stays out of my way when shooting, and is not flashy to the locals. Dorfman Pacific Co. waxed canvas model. Perfect in the rain or hot sun. 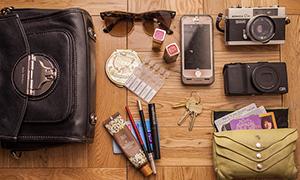 Completely crushable for storage in the side pocket of the backpack. The brim has a metal loop in the outer edge which can be quickly formed and adjusted to block the elements but not get in the way of shooting. Also has a chin strap which is invaluable when riding my motor scooter. Leica glass except for the Hyperprime which is a new lens from SLR Magic in Hong Kong that I am trying out. This lens is a T/0.95 and equates to an f/0.92 wide open. Leica Universal Viewfinder (aka The Frankenfinder). The bubble level, adjustable frame lines from 16-28 and parralax correction make this the very best external viewfinder. Leica D-Lux 5 (for video and macro). Colorchecker Passport, very handy for taking a quick manual w/b or color reference shot. 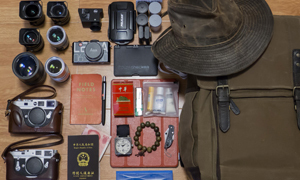 Field Notes Notebook – I stock up on these every time I go south to Hong Kong. Leica Pen – Courtesy of Tom Smith and Tom Brichta, Leica Akademie NA. iPad 3 – Mainly for entertainment but I do have NIK Software’s “Snapseed” installed which is a great little program. Mostly I shoot DNG files and edit on a 13” MBA. Cigarettes, “Chung Hua” brand – Often used to break the ice when talking to locals trying to get photos and portraits. A cheap lighter because I constantly loose them in airports. Personal Hygiene Kit – Lip balm, hand sanitizer and sun block. Bell & Ross BR01-92 – mechanical watch. Buddhist Prayer Beads – Given to me by my Chinese mother-in-law. Pocket Knife (cheap) – A multitude of uses, but I constantly loose them in airports. Jambox Speaker – My friend William Palank, the skilled travel photographer from San Francisco, (www.williampalankphoto.com) told me about the Jambox, and it’s a wonderful accessory to travel with. Connects via blutooth and lets you share music with a group of people. Wonderful for bringing Jazz to central China. Thanks for sharing this brilliant bag with us Stephen, I love the cultural references and the Chinese smokes. Please check out the links and make sure you comment. 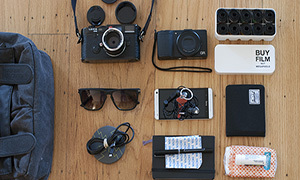 Cool gear and great portfolio. I love how colour co-ordinated this all looks, That hat looks great too. Thanks Rob, I’m not sure about the color coordinated part, unless khaki is a color! As a western photographer living in China I try to blend in as much as possible, which means no Yankees baseball caps or bermuda shorts. The Camps Bay backpack is perfect as it looks like what the locals would buy (military surplus) and the hat helps to hide my features. If I shot with a big dSLR people would instantly think “Professional” and either turn away or demand money. Shooting with the Leica is discrete. Also people here just assume it’s an inexpensive old camera, as I keep the half cover on which hides the LCD. It’s all my version of a Chinese photo-safari…except I’m stalking portraits instead of big game.